The supermassive black holes at the center of mature galaxies tend to be quiet. Their activity will have blasted away most of the nearby gas and dust, and any stars that were in unstable orbits were likely to have been torn to shreds long in the past. 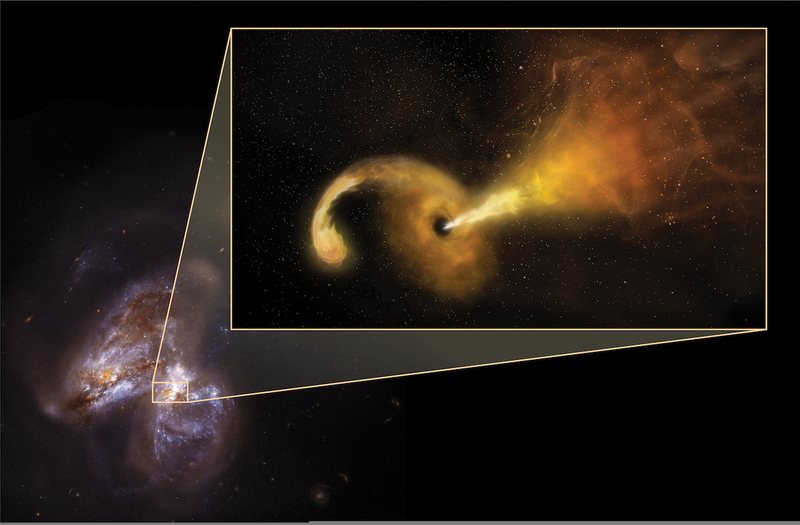 But on occasion, the chaotic nature of complex orbital interactions should bring a star close enough to experience what's called a tidal disruption event—the star is ripped apart by the black hole's gravity. We've done modeling of what a tidal disruption should look like, and it's clear that it ought to produce copious numbers of energetic photons. The problem is that we've not seen many events like this. Now, taking advantage of a decade of observations, researchers who recently published in Science have spotted what seems to be a black hole tearing apart a star and converting some of it into a jet of material traveling at a quarter of the speed of light. The reason we haven't seen it before? Rather than showing up at the wavelengths we expected, the event was visible in the infrared. The story starts all the way back in 2005, when researchers identified a transient light source, meaning something that was plainly detectable hadn't been there in earlier images. The source of the signal was traced to an unusual object: Arp 299, which contains two galaxies in the process of merging.